Please, please, please don’t cheat and buy buns at the store for this sandwich, or any other meat that requires a bun. Please. Buns from the store are made en masse by people (or more likely machines) who don’t add a very important ingredient – love. Without the love from homemade buns, your sandwiches will look just like every other sandwich. Don’t you want to make other sandwiches envious?! Do you really want to eat buns made by machines? Allow your sandwiches to be the best and stand out from the crowd. Catch-up with the how-to on tri-tip here and the garlic butter here. Read on for the BEST homemade hamburger buns recipe! After reading that store-bought bread contains plaster of paris, I’ve resolved to make my own bread whenever possible. I did give-in and buy hot dog buns for the Fourth of July when dinner plans were scooted up to lunch, but I was reluctant and to be honest, they didn’t taste that good. While it’s entirely possible to skip this part and rely on buns from the store, I highly discourage that. Besides the nutrition stuff, homemade just tastes THAT MUCH BETTER! Seriously! Homemade hamburger buns took this sandwich to a rank far higher than any other bun could possibly do. These were fluffy, soft and absorbed the garlic butter like it was their job. Even my dad (a professional chef) wondered where we got the buns from! He thought we bought them! Never again will I disrespect the tri-tip sandwich with a store-bought bun. Measure yeast in a mixing bowl. Warm milk to 105-110 degrees (I used the microwave and a candy thermometer) and pour into yeast. Let stand for 5-10 minutes while yeast activates. When the yeast is slightly beer-foamy (milk won't make it as foamy as water does), add all of the other ingredients and mix on medium until dough is smooth and elastic (5-10 minutes). Pour into a large oiled bowl and let rise in a warm place until dough is doubled in size, 1-1½ hours. After the dough has risen, pour onto a flour surface and knead to form a long log-shape. Cut dough (I use a pizza cutter) into 12** equal pieces. Shape pieces into round buns and place on a cookie sheet. Cover loosely with plastic wrap sprayed with cooking spray (sprayed side down). Preheat oven to 375 degrees and let buns rise for 30 minutes. Bake for 15-22 minutes until lightly browned. ** The yield on the original recipe is 12, but the buns were slightly bigger than we preferred. I recommend dividing the dough into 14 buns the first time you make this recipe and then alter (if necessary) from there. They rise quite a bit in the 30 minutes of rest, and then again while baking. 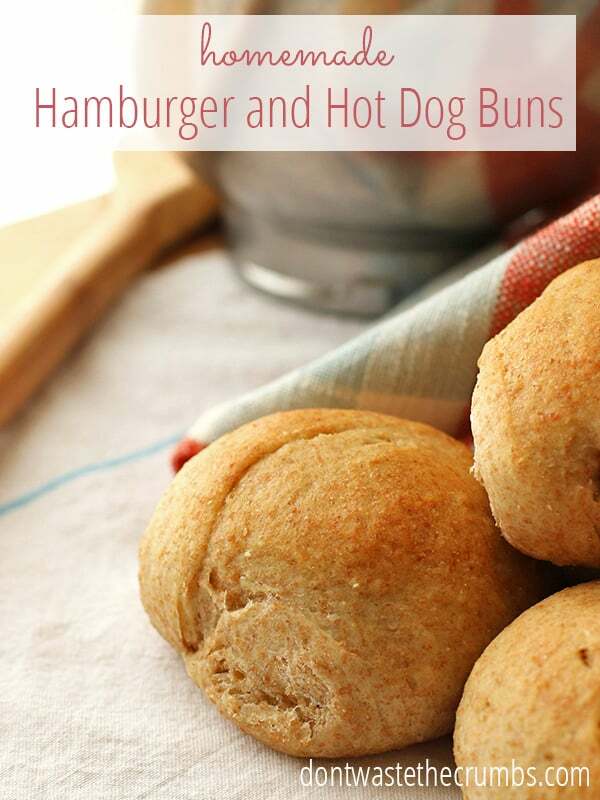 I’ve made this recipe a few times and it’s made amazing buns (either hot dog or hamburger) every time. 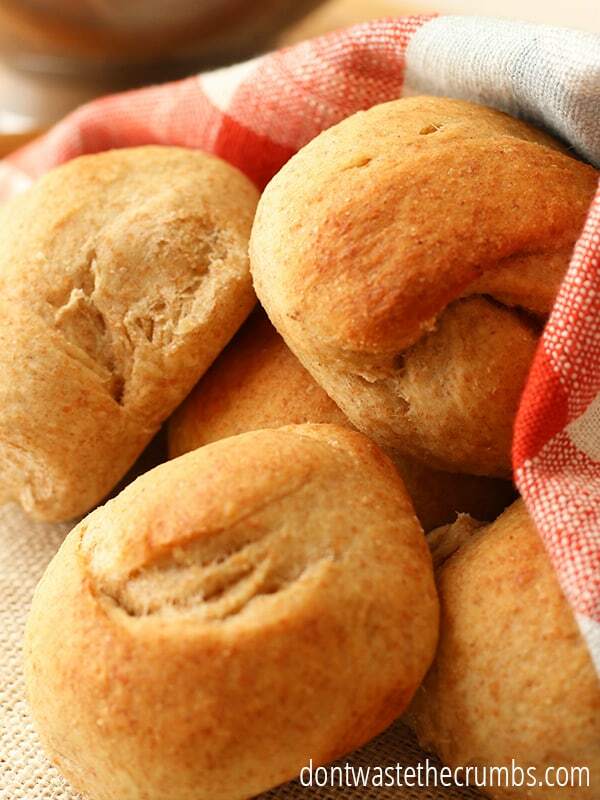 I tried to make this once for dinner rolls and while they were good, they sorta tasted like buns, lol. Go figure, right? 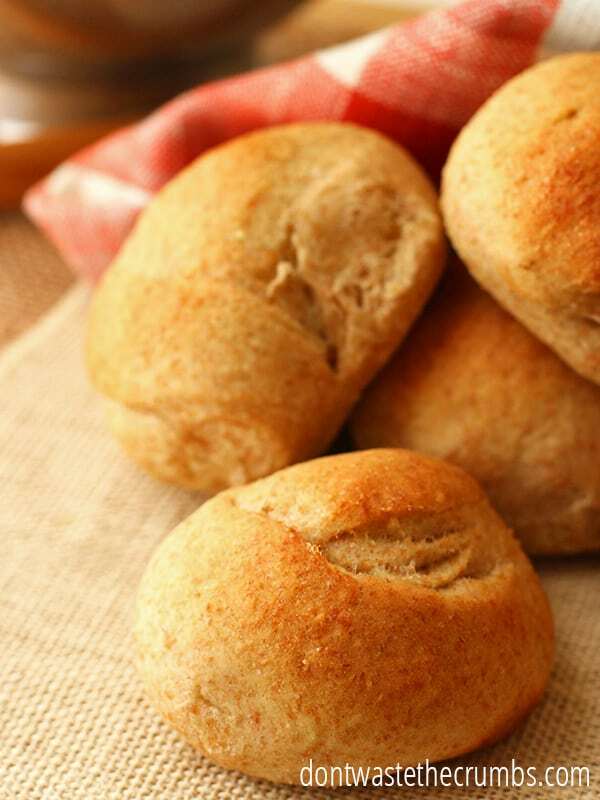 I have a different recipe for a great dinner roll which you can find here, but just in case you’re feeling adventurous, learn from my taboo on the dinner roll idea. I’ll be honest with you guys – the math on this recipe was gruesome. Lots of conversions and googling and more adding than I care to do on the average day, but the end results are fairly easy and straight-forward (I’ll skip the gruesome part, but contact me directly and I’ll send you the details). This entire recipe costs $1.54. We made 12 buns so each bun costs a whopping 13 cents. Wow – that’s food for thought when we’re paying full price for that plaster of paris! Our total cost so far for our best-ever tri-tip sandwich is $1.19. While I designed this bun recipe with Tri-tip in mind, I have since perfected the BEST burger recipe. You can find that here. Top your burger with homemade ketchup, 2-minute mayo, and your other favorite goodies. Then pair with crispy potato wedges and you’re set! It’s way better than fast food and your wallet will thank you. Need more ideas on how to cut the budget and spend less on food? CLICK HERE. What’s your favorite homemade hamburger buns recipe? I don’t have bread flour will regular flour work? You can substitute all purpose flour for bread flour, but the bread will not rise as much with the lower percentage of gluten in all purpose (11% as opposed to ~13% in bread flour). If you have it, you can add one tablespoon of vital wheat gluten for every cup of all purpose to achieve the same affects that bread flour would do. So you would add the extra wheat gluten, plus the gluten called for in the recipe? I got some after buying sinew local Oklahoman flour a while ago. The farmer said something about the wheat that grows best in the conditions here is red wheat, which has less gluten than white wheat. Or something. That flour did make the best bread ever, but it ran out long before that little bag of gluten did! And now that I know this trick, I definitely won’t have to buy bread flour anymore. Thanks! These are the only buns we eat. I have been making them every week for over a year. We make them in many different shapes. They are the best I have ever had! I’ve tried the hot dog buns recipe twice and I can’t figure out why it won’t rise!! Is there a difference between gluten (powdered stuff I bought at the health food store) and vital wheat gluten? I asked at the store and they said it was the same thing. My dough was certainly springy and elastic, but no rise em! Any ideas? I believe that powdered gluten is the same as vital wheat gluten – both come in powdered form and should act the same in the baking process. Even if this wasn’t added, the yeast should cause some rise, so I don’t think the gluten is the issue at hand. The first step is to make sure your water is at 105-110 degrees – any cooler and the yeast won’t activate; any warmer and the yeast dies. Second step is to make sure your yeast is fresh. Sometimes old yeast just won’t work. When you mix the two together in your bowl, you should see foam that resembles the head of a beer. Let me know if either of these corrects the problem and we’ll keep trouble shooting! I know this is an old post, but what is vital wheat gluten, why is it needed, and where do I get it? How do you make the hot dog shape? Do you use a special pan or just shape them into cylinders on the pan? Thanks. I just shape them into log-ish shapes right on the pan! Yes! Make them and freeze them baked. Then pull out and thaw as needed! can I use whole wheat flour and white whole wheat flour?? I don’t have bread flour or VWG. Yes Veronica, you can! Make sure you follow the “rise until doubled” in size rule, and not go by time. It will take a bit longer without the extra gluten. Enjoy! I’m planning on making four batches of these for a BBQ. Could I make the dough ahead of time and leave them in the refrigerator overnight? What would be the best? Thanks! Hi Mario! I haven’t tried that method personally, so I can’t say for sure it would work. If I made 4 batches, I’d start a double batch through the first rise, then halfway through start a second batch. You’ll essentially be making a double batch, back to back. Once the buns are baked, you can fridge/freeze as necessary! Making these for the second time now. The first try didn’t include vital wheat gluten, and they were still exceptionally delicious. My husband raved about them. This time we’re including the vital wheat gluten and I have a pizza cutter to use when shaping. I don’t think we’ll ever buy buns again if there isn’t a time constraint. When I had a chance, I’m definitely going to stock the freezer with these for barbecue season. Thank you so much for this great recipe! Thank you for this! I’ve only made rolls from my reg bread recipe so far. Just wondering…is the “vital wheat gluten” necessary? I don’t have it, but will get it. Thank you. Hi Rusti! No, you can omit the vital wheat gluten and they’ll turn out just as tasty. 🙂 Enjoy! Can this recipe be made in a bread machine for the mixing and rising part?